Earlier I had talked about my next bike acquisition, which I decided would be something totally off-the-wall. 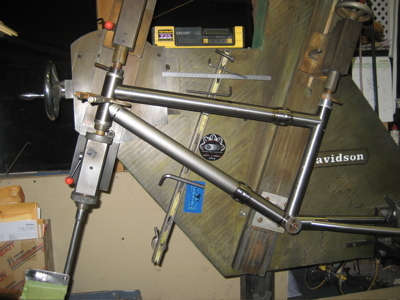 I double-dog-dare you to find another custom titanium BMX with S&S couplings and disc brakes and a rear derailleur. Not that I tired to come up with something unique. I just thought about what my current stable of bikes lacked, whether it be a particular style of bike or combination of features. This is what I came up with. It’s being built by Davidson Bicycles, which is within Elliott Bay Bicycles. And I wrench there, as well as handle the buying. I got a text message from the frame builder on my day off: “It was a good day in the frame shop for BMX bikes.” So I had to go down and see the bike on the welding jig. My girlfriend asked me if I was going to go drool over my new Frankenbike, but that moniker doesn’t really seem to fit. The bike is too small to be named after Frankenstein’s monster. I’ve taken to calling it the goblin bike. The construction is relatively straightforward, except for the chain stays. There really aren’t any braze-ons; the Paragon dropouts already incorporate the disc caliper mount. However the chain stays are short, in the style of BMX bikes, but the cranks and chainring are a little tighter than BMX would normally have. That doesn’t leave much space for the chain stays between the crank/ring and fatty tire. 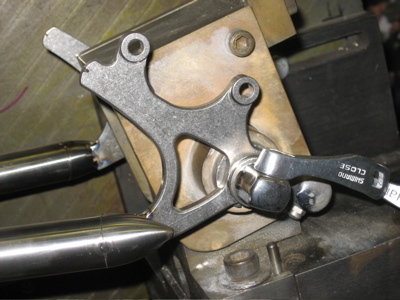 Will the frame builder chose to use a chain stay yoke. 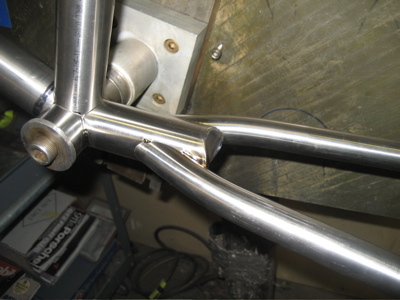 Will hasn’t made the seat stays yet, but they’ll probably be single bend 3/4” titanium tube. This bike is likely to be really stiff and tough. Maybe not world class BMX stiff, but much stiffer than old school BMX and any mini-wheeled travel bike like a Bike Friday. I want a travel bike that packs up tiny and is bomb-proof, but the bike will have better efficiency than your standard BMX bike because it will have multiple gears. Since I am fairly short, I can actually run my saddle full height on this bike with a stock 410mm seat post, and a stock BMX handlebar will be more than high enough. No custom or esoteric parts required. Next Next post: International Win For Susan Day!